When you power on the Android Phone for the first time after purchase, it would show you the large Android Robot which has to pressed to initiate the phone functioning. As it is the first time with the android phone, you would be taken to through a few instruction steps which you could follow or skip one by one. If you want to use your android phone in your own language not in English then the option is provided for you at the bottom right section to change the language. This is generally asked when you start your android phone for the first time without inserting the SIM Card. The Android interface wants you to connect to the Internet for the setup of the Google Account. 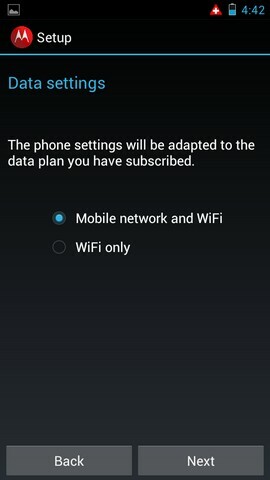 Once you insert the SIM Card and starting up the phone for the first time, then your device would ask you to connect either the Data network or Wi-Fi, based on your choice. If you using the GSM phones it will ask you to connect Wi-Fi or Data Network. But if you use the CDMA android phones it would ask you only about the Wi-fi connection. This is because CDMA phones do not require the SIM card. In order to sign into the Google Account you must have the Wi-Fi connection. If you want to use all the Google features such as Gmail, Google Drive, Google Calender and Google Talk then you must sign into the Google Account. The adding of the Google Account immediately or later is very important. 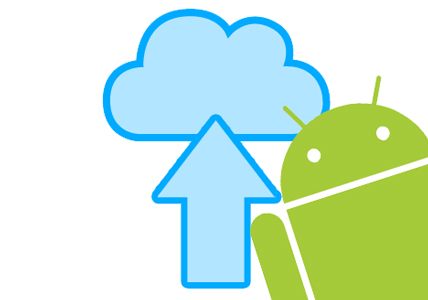 As android takes the basis of this account to backup your Phone Settings to the Google Servers, make the Google Play Store accessible for the users and for the users to take the advantage of the various Google services on the phone. 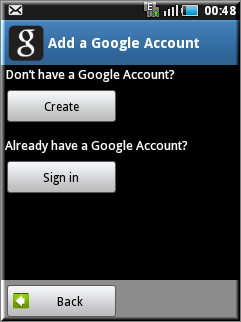 You don’t need to create a new Google Account separately for your android phone. What you have in the computer the same can be use for the Android phone. If you have an Google enterprise account, then the direct signing in would not be possible. So, you need to follow a few different instructions to login through your Google enterprise account. If you were using the Android phone previously and had made a few settings, added contacts to the Google Account and now you want the same stuff in your new Android phone also then you need to add the same account in the new Android Phone and those Settings are downloaded to the new phone. This is the form introduced to you by the company of the phone. You need to agree the Terms and Conditions and the Policies given by the manufacturer. When you login to your Google Account in the new Android Phone, then it would take you through a few steps of Service Settings such as Location, Backup, Date and Time. With the help of the backup service you can easily backup your Personal data, Browser bookmarks, User dictionary with the saved new words, Wi-Fi passwords etc. You can backed up all the above mentioned things to the Google Servers when you have your Google account added to the phone. The backup will be definitely useful for you to restore the data just in case if you lost the same due to any reason or in-case you want to reset your phone settings. Not only for this, you could also restore the same data into any other phone when the same Google Account is used in a new Android phone. 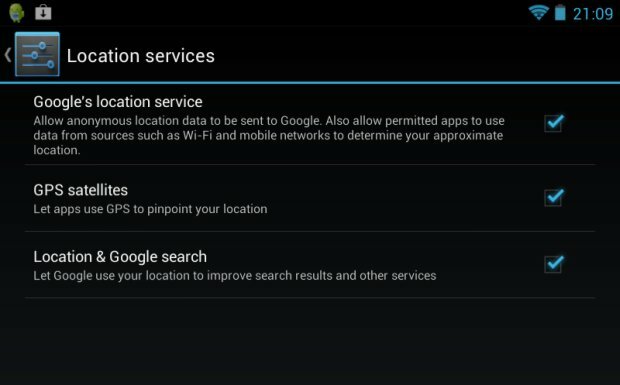 The Google’s Location service is something that would come to good use in many applications including the Google Maps, which need the GPS sensors for tracking the location and Google acts smartly on providing search results in accordance to your location.The location settings provide the options to either keep the service active or deactivated. 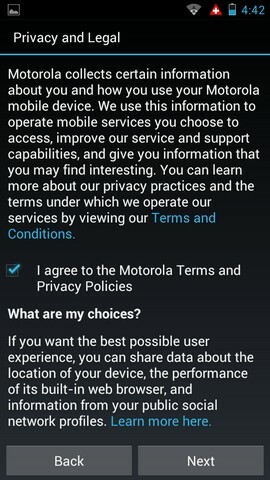 It would be available later on in the “Location and Security Settings” too. Manual Setting of the date and time is asked by the phone when you haven’t connected it to the mobile network. When the phone is connected to the mobile network when the SIM card is inserted, then you could choose to use the network’s time accordingly, and it would be helpful when you are on roaming. If you lost or forgot your Google Account password, then don’t worry just go to the Google.com and sign in, and click on the link “Can’t access you account” that option will take you to the steps which would help in resetting the account password. When you add your Google account, you can also add the same account to the Facebook, Microsoft exchange activesync, E.mail account of your phone etc. If you are decided to do that later then you can do that through the “Account and Sync” Settings.